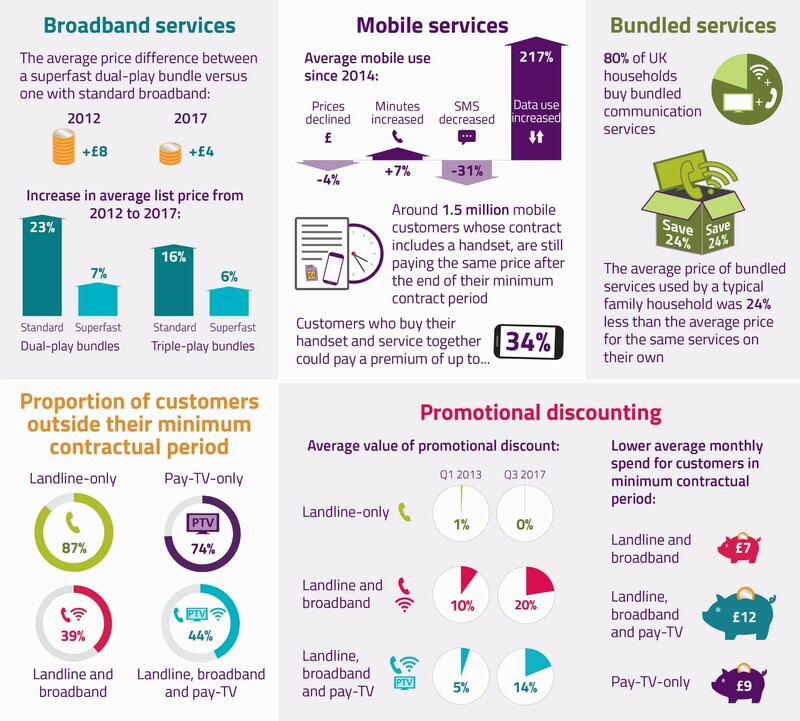 Ofcom research published today shows that while most people are getting value from their phone and broadband services, some broadband and mobile phone customers could get better deals from their providers. The research is based on our latest data for home phone, broadband and TV services in the UK. We found that while more people are using superfast broadband and 4G services, average monthly household spending on telecoms services has fallen by 8% over the past ten years. However, many people could upgrade their broadband service at no extra cost. Around four million UK homes with standard copper (ADSL) broadband are currently outside their minimum contract period, and could upgrade to a superfast package for the same price, or less. This is particularly relevant to BT ADSL customers who are not in a promotional discount period. Over the past two years they have seen their prices rise by around 80% a month, to £42.99. However, BT’s superfast services start at £24.99 a month. Our research also showed some mobile customers could be over-paying for their phones. Some mobile contracts include payments for both the phone and the calls made by the customer, with the cost of the bill reducing once the cost of the phone has been paid off. However, most tariffs that include the cost of a phone continue to charge the same monthly price after the minimum contract period has ended. According to our research, this issue could be affecting around 1.5 people. Broadband and mobile firms often target their best offers and discounts at people who negotiate or switch provider. So, consumers who shop around, and know when their initial contract period ends, typically pay less than those who don’t. We’re working to help people make the most of the choice and value available in the market, and we recently published an update on our work in this area. To start, we are focusing on end-of-contract notifications, where providers would proactively inform customers when they are near or at the end of their minimum contract period. We are also looking at the issue of mobile customers continuing to pay the same price after the end of their minimum contract period, where this price reflects the cost of their phone. Recently we also published our research into the levels of service consumers can expect from their broadband and phone providers.